Preeti Shenoy is one of my favourite writers for a simple fact that her writing has no tantrums. It's simple and to the point which makes her books interesting. The first book I read of hers was "Life is what you make it" which I've reviewed here. The interesting thing about her books is the title. 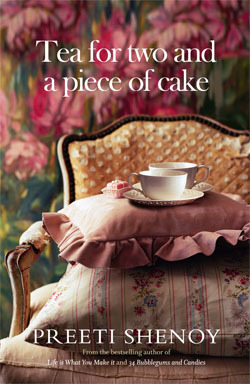 "Life is what you make it" inspired me in a way and hence I decided to pick up her latest book "Tea for two and a piece of cake". Nisha, a simple, 26 year old girl who is very content with the way her life is going. Her job is everything for her. But, suddenly unexpected things happen and she falls for a guy. The guy is a richie -rich and she loves him to the core. But, the book begins with when Samir, her husband, dumps her abruptly. She being abandoned by her husband, Samir, breaks in her a way, but she is a wise woman and never lets anyone hurt her self respect. In her quest of life, with her two children, an old friend of her comes back as a breath of fresh air. Akash, Nisha's ex-colleague and a very good friend tries to fix her life. There are a few more characters in the book which are well defined and have affected, taught Nisha a few harsh realities of life. It took me less than 5 hours to finish this one. Yes, its fast paced and hence I said, Preeti Shenoy's writings has no tantrums. It will keep you hooked till the end and would definitely supply you a few things to ponder on.